Many spring wildflowers have to struggle through rank vegetation, but Cuckooflower (sometimes written as Cuckoo Flower) usually manages to stand head and shoulders above the crowd. Being gregarious, they make wonderfully subtle floral display that is visible from afar. Typically 30 to 50cm tall, these hairless perennials have short-stalked pinnate leaves with ellipsoidal leaflets; they alternate up an unbranching stem above a rosette of long-stalked round basal leaves. The narrow-stalked flowers, in upright spikes, are 1 to 2cm across; they have beautifully veined pinkish-mauve or occasionally white petals backed by six sepals of which four are long and two are short, and the anthers are yellow. The flowers droop and closeat night or during heavy rain. Common and widespread throughout Britain and Ireland, Cuckooflower is found throughout Europe and in many other temperate parts of the world. 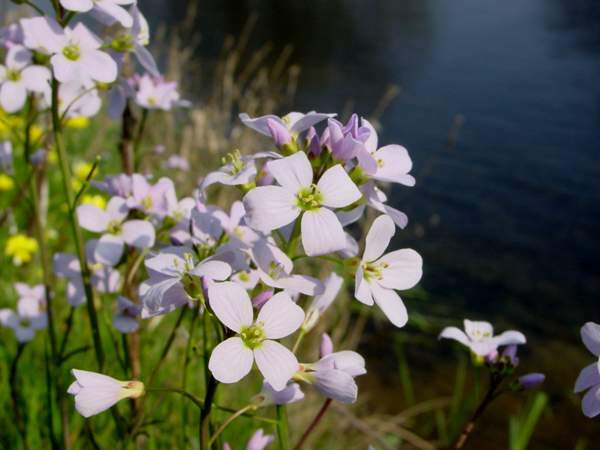 Several subspecies of Cardamine pratensis are recorded in North America, although some authorities recognise Cardamine pratensis not as a single species with subspecies and varieties but as a complex of closely-related species. 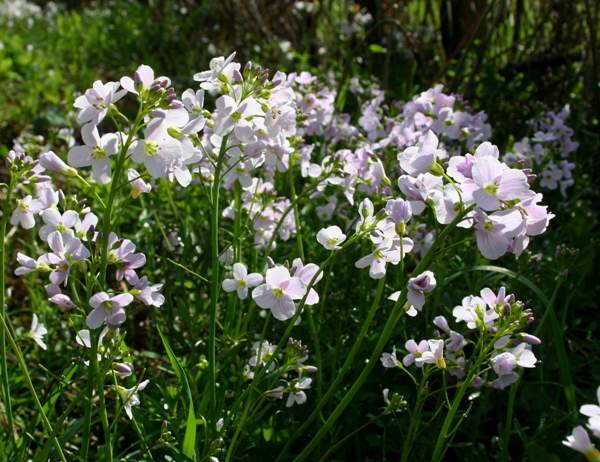 Cardamine pratensis favours damp meadows and the soggy margins of streams, ponds and lakes. This flower, like its avian namesake the Cuckoo itself, comes in April, but May and June are the months when Cuckooflowers bloom in greatest profusion. A few stragglers in shady places usually last well in to July. 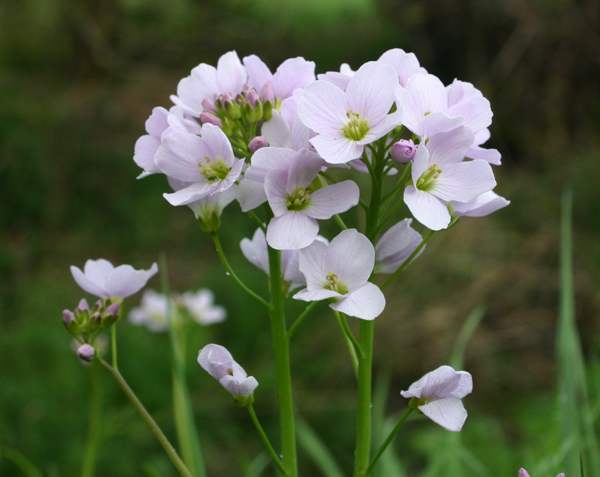 Cardamine, the genus name, comes from the Greek noun kárdamon, an expensive spice plant originating from India, Pakistan and Nepal, although nowadays most of the world's cardamom spice is grown and processed in Guatemala. There is no close botanical relationship between the various cardamon plants and Cuckooflower, so the reason for this choice of genus name is quite obscure. The specific epithet pratensis means 'of meadows', and damp meadows are indeed the habitat most associated with Cuckooflower. Other common names for this lovely wildflower include Milkmaids and Lady's Smock. Milkmaids, Lady's Smock and Cuckooflower are just three of many common English names given locally to this spring wildflower. 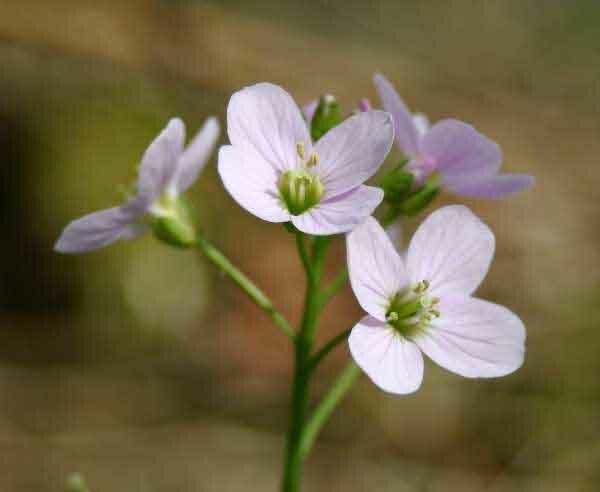 In some field guides you will also see the two-word form Cuckoo Flower used. Although definitely not a substitute for the spice cardamom, Cardamine pratensis leaves are edible and can be used in salads. Orange-tip Butterflies Anthocharis cardamines find the flowers particularly attractive, and Cuckooflower is one of their main larval food plants. The young larvae generally eat first the flowers and then the leaves, stems and seedheads of their host plant. The Meadow Froghopper Philaenus spumarius is attracted to the sap of these plants, and itslarvae form frothy blobs on the stems; some people call this cuckoo spit. Cardamine pratensis is the official County Flower of the old county of Brecknockshire (currently within Powys) and of the county of Cheshire. The pictures of Cuckooflowers shown on this page were taken in Wales UK in May and June.